Posted on October 31, 2016 at 11:52 pm. 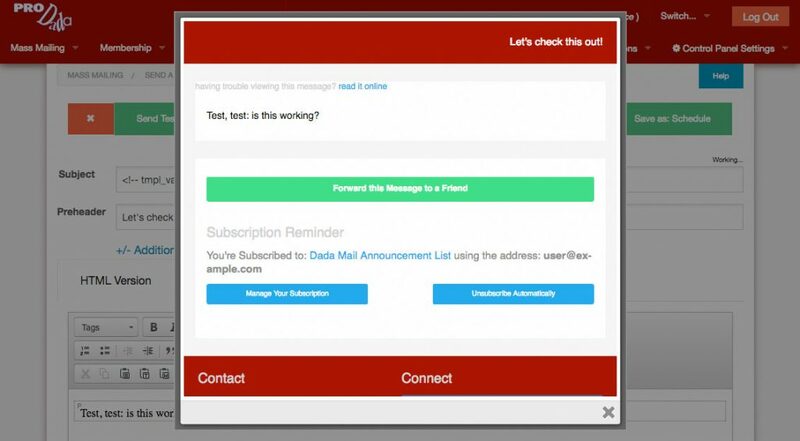 Easily wrap your mass mailing message in one of the provided layouts that come with Dada Mail. Layouts provide the necessary information for your mailing list message, so you don’t have to: things like making sure the unsubscription link is included correctly in every single mass mailing message you send out. Layouts and Dada Mail’s support for the Zurb Foundation for Emails framework makes your mass mailing email messages look great without any extra work from you. 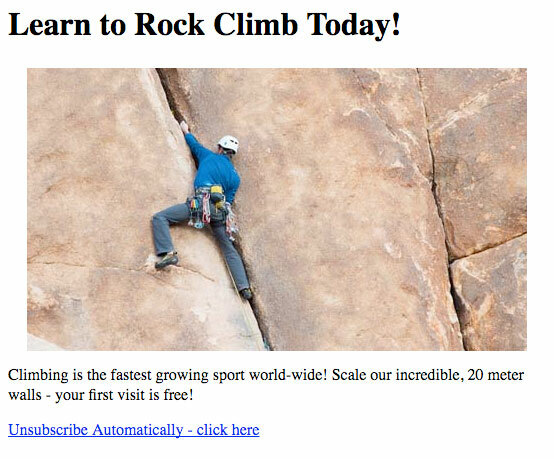 Layouts can be found in both the Mass Mailing -> Send a Message, and Mass Mailing -> Send a Webpage screen. 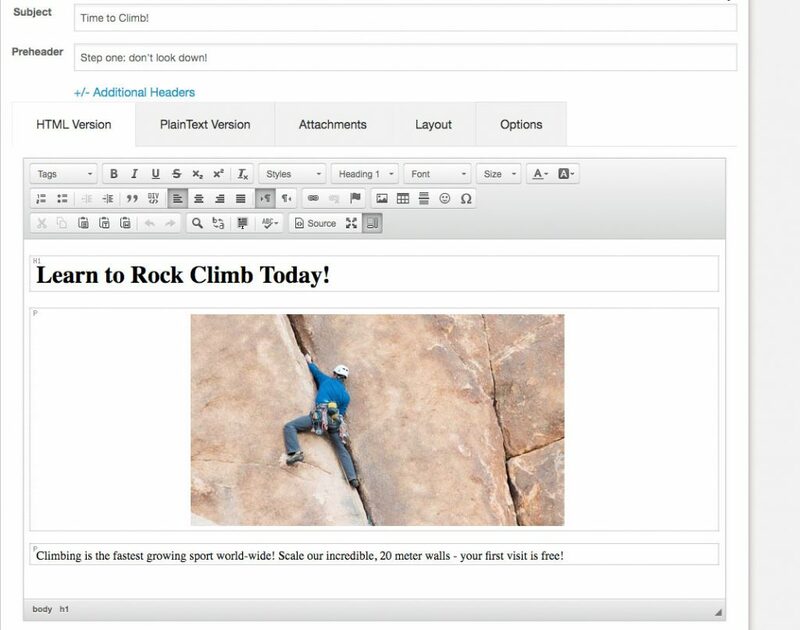 Look for the row tabs: HTML Version, PlainText Version, Attachments… – the next tab will be labeled, Layout. Now, let’s see what this message will look like when we apply one of the included layouts. In v10, there’s a new button on the top bottom bar labeled, Preview. 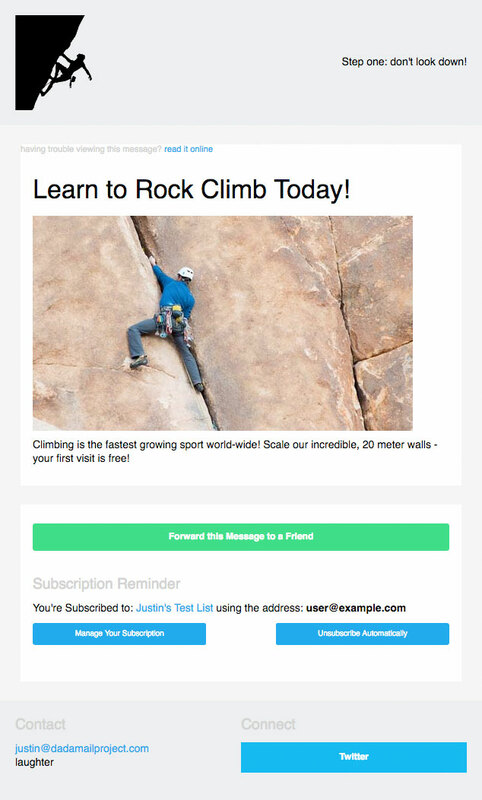 Clicking this button will show a preview of your mailing list message in a modal window with your selected layout applied. 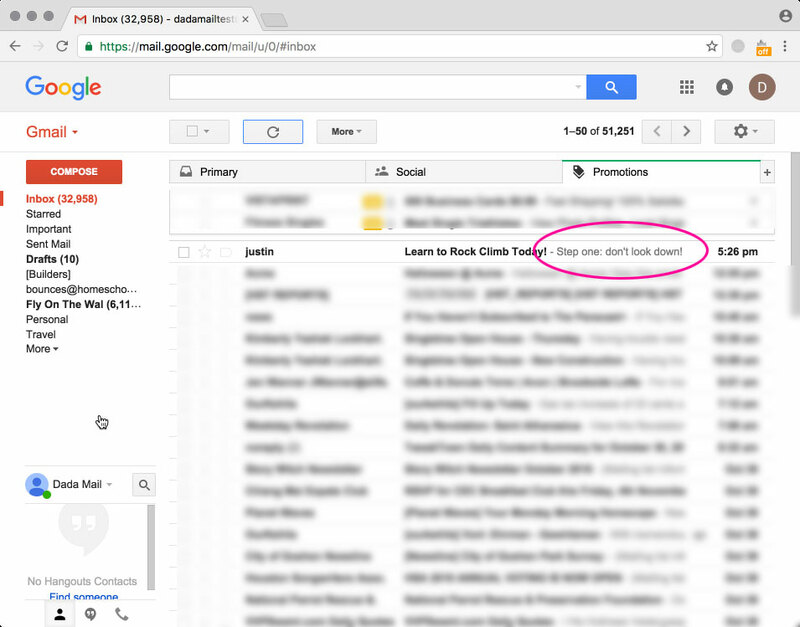 This saves you quite a bit of time with testing: no need to send yourself test email messages anymore, just to double-check that your email looks good! After the banner, there is a small (literally!) line of text, which gives a link to the publicly available archived message, so that if the message below isn’t viewable, you can still see the message from the archive. 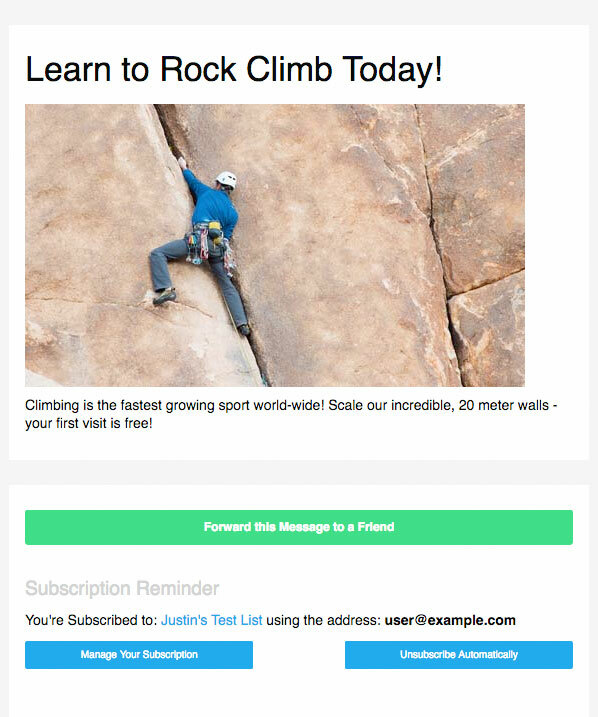 Afterwards, there is a section that has buttons and links to forward the message to a friend, manage the subscription, and unsubscribe from the mailing list. These links are specific to the individual subscriber. You won’t have to handle this yourself. Below this information is the message footer, which has contact information, and social networking links. This information can also be added to, and edited in the Mailing List -> List Information screen. If your main content deserves front and center treatment, this is the template to use. Gone is the top banner and bottom social networking links for a more clean appearance. The unsubscribe link is still present, to keep with mailing list best practices. For Discussion List Messages is similar to the Minimal layout, but as you may have guessed, is designed specifically for discussion list messages, with a large button to start a new post. This theme is used by default if you’re running a discussion list. As you can see, no layout or styling is applied. One curious artifact of this is that a unsubscribe link is added to the top of the message, since Dada Mail did not detect one in the mailing list message itself. This is done since Dada Mail enforces the rule that all public mailing list messages MUST be sent with an unsubscribe link. For our message, Don’t use a Layout wouldn’t be the best suggest for a layout, but if you have a full-blown message with its own layout that you don’t want encased in one of the other provided layouts options, this would be a good option choose. So that’s an introduction to layouts! What’s your take on layouts, have you found them useful for your own mass mailings? Posted on October 28, 2016 at 10:26 pm. In this post, we’re going to go over how to do the actual customization, and start using our new theme live on our own site. I’ll be prompted for a new name for my project. I called mine, dada_mail_site. The build process will detect whenever we’ve changed any of the source files of the project, and recreate the distribution files (located in, dist) so they’re always up to date. Now that everything is all set up, let’s do some customization! I’d like the header and footer of my messages to have the same deep red that Dada Mail’s default UI has. I also want the text in the banner and footer to be white, rather than black, to stand out with the darker background. Finally, I’d also like the default text to be a little larger and a dark grey, rather than black. Let’s work on the default text size and color first. This is controlled in the, src/assets/scss/_settings.scss file. This file contains Sass, which will be transformed in the cascading style sheet (CSS) that the theme will eventually use. That takes care of the banner and footer background color. 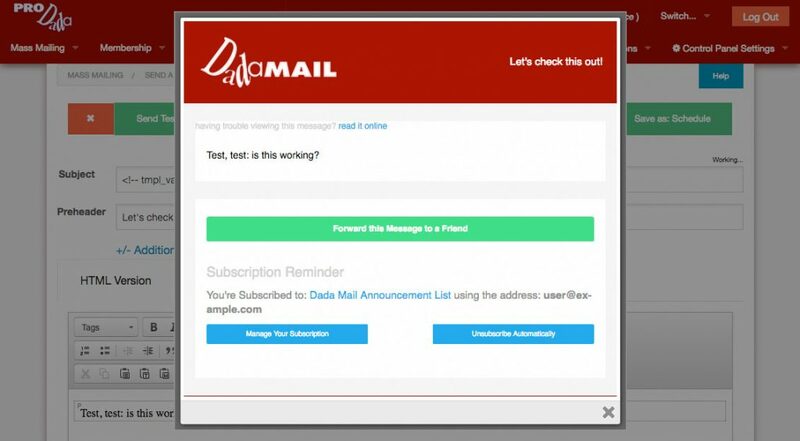 On our site, we’ll navigate to the dada_mail_support_files directory, then go to themes/email. I’ll create a new directory with the same as the name of my Foundation for Emails project: dada_mail_site. I’ll change into that directory, and copy over the entire dist directory my project has made, inside the dada_mail_site directory. Once that’s complete, my theme is essentially, “installed”! Let’s set up my mailing list to use it. I’m going to log into my list, then navigate to, Appearance -> Email Themes. Our new theme should now be listed when we click on the popup menu. Select it, and Save! 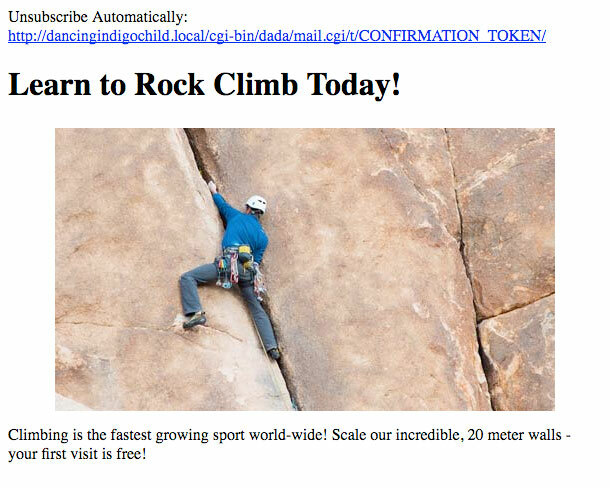 We’ve just scratched the surface on how to create a custom email theme for Dada Mail. Please try it yourself, and let us know if you have any questions or comments!